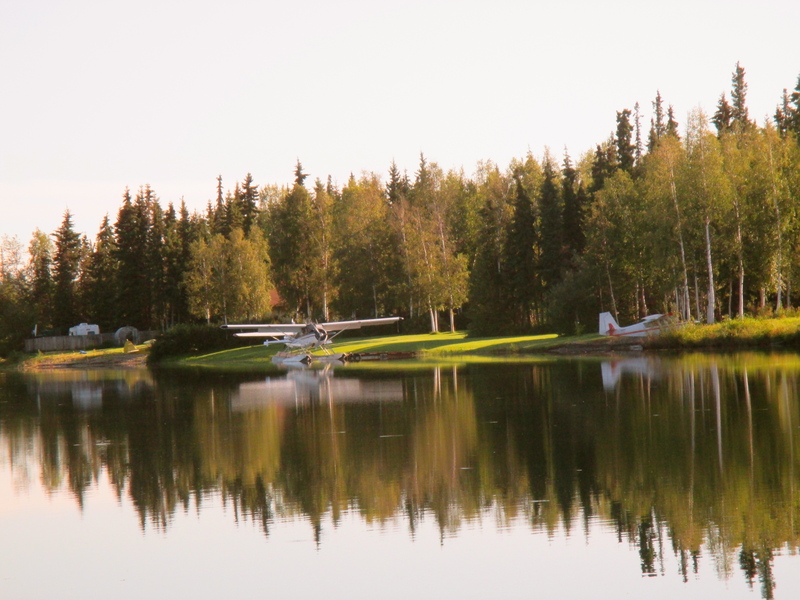 After a night of wind and rain, the sun exploded across Chena Marina this morning, turning it into a mirror of paper birch and spruce, float planes and ribbons of grass green light. A pair of Canada geese squawked and nosed around in the shoreline silt before heading south. Since little r didn’t need to be picked up from pre-school for a while, I decided to drench myself in bug dope and maunder into the woods with my Cannon. 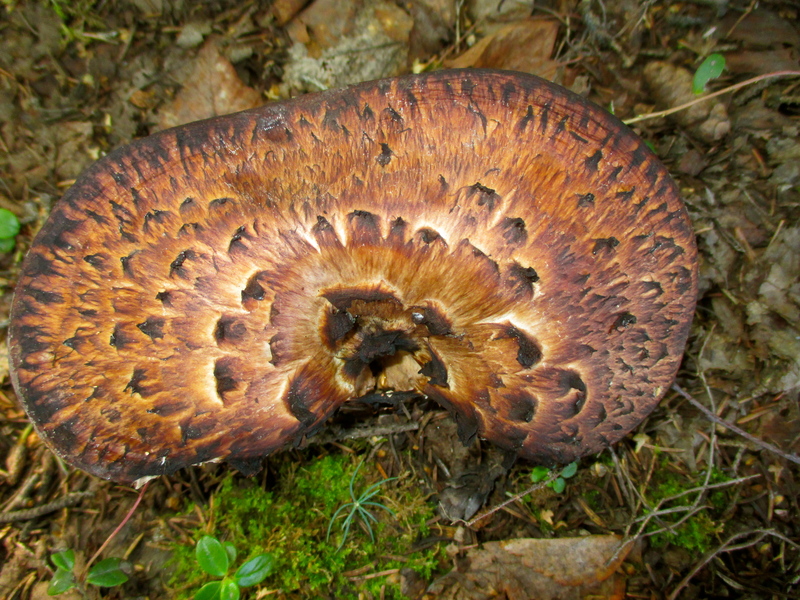 Now, being from the “U.S.” (or “Lower 48”), as locals like to say, I know next-to-nothing about the mushrooms of Interior Alaska. 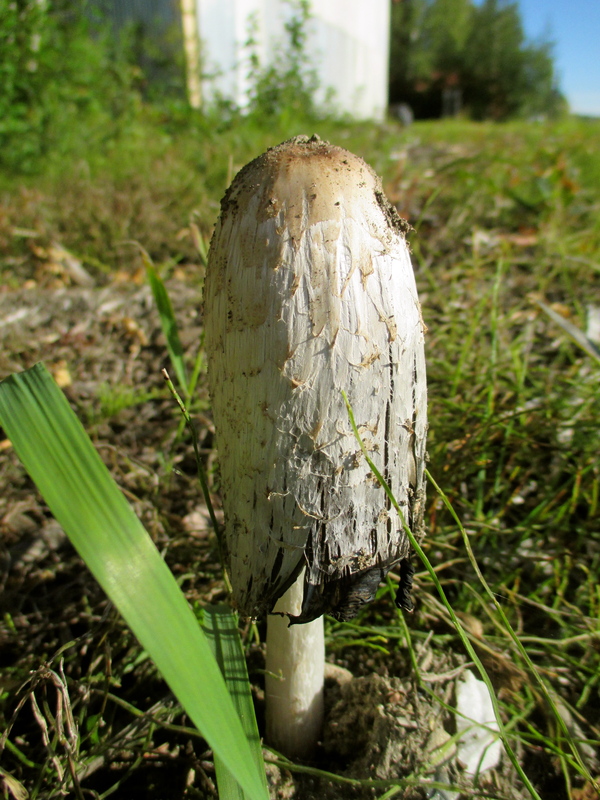 But last year some German friends came by for a moose dinner and picked what they called “Shaggy Manes” in a field near the hangar that lies between our house and the marina. I headed that way and found Cousin Itt, surrounded by a hundred brothers and sisters basking in their weed bed. 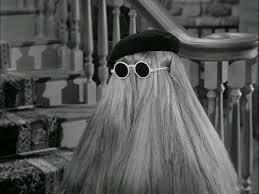 Here’s Cousin Itt from the Addams Family. Same-same, right? Our German friends harvested a basketful, dusted off most of the dirt and bugs, chopped the shaggies coarsely and sauteed them in a mountain of butter, salt and pepper. They were exquisite. Today, though, I left the cuties alone, thinking I’d return later to paint a watercolor if the mosquitoes weren’t too terrifying. And then we’d eat them. I ambled in and out of the birch and spruce groves fringing our dirt driveway, rambled over roots and rocks, through rose hip brambles and high-bush cranberries. 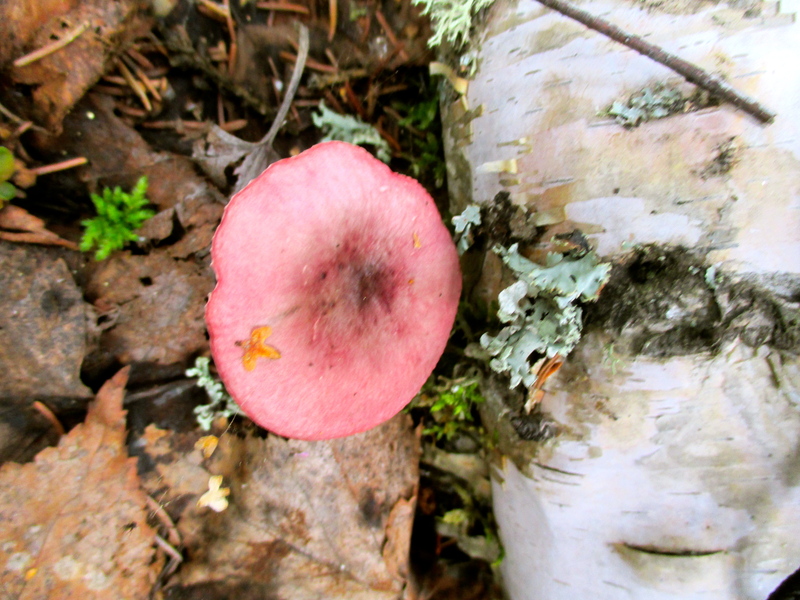 I found patch upon patch of mushrooms without knowing any of their names so, forgive me, I made them up. I’m going to have to take a class or buy a field guide, or both, I told myself, realizing that it wasn’t just little r who needed names for the world. 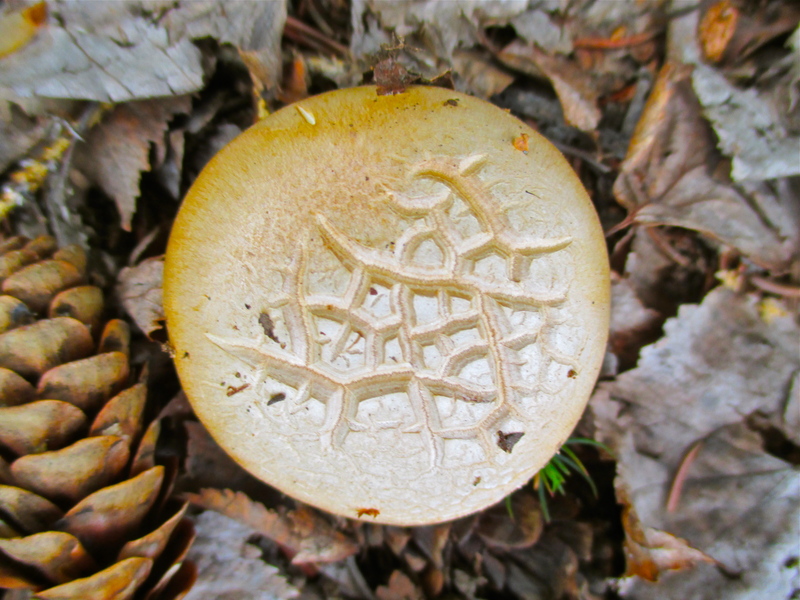 As you can see from these few photos, I had entered a place where the mushrooms were incredibly beautiful, and as I moved deeper and deeper into the forest I felt like I was in a strange, Alice in Wonderland dream. 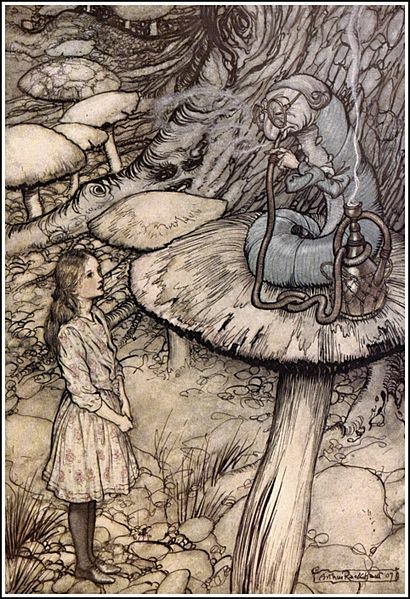 Alice: I hardly know, sir, just at present—at least I know who I WAS when I got up this morning, but I think I must have been changed several times since then. I’ve shared before that a seventh grade student of mine once told the class, “Sometimes I hallucinate in the woods,” and I understood, now, what he meant. 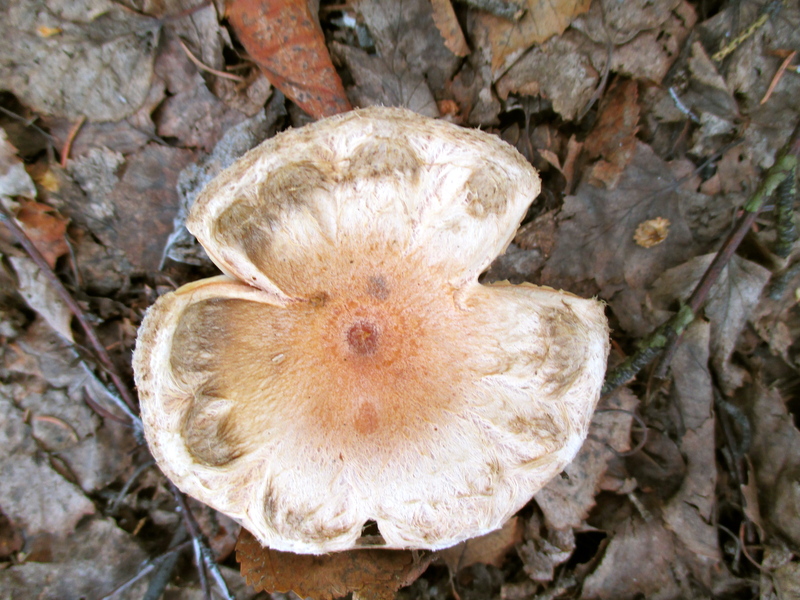 Lightheadedness and confusion, an intoxicating mushroom madness made me giddy. I twirled and giggled, ripped my pant leg on a birch branch, tripped and fell onto my side in the boggy wetness next to a mound of moose droppings. Was there just too much magnificence here? Or were invisible forest fairies blowing toxic spores into my nostrils. I wiped my nose on my sleeve and that’s when I came to my senses. 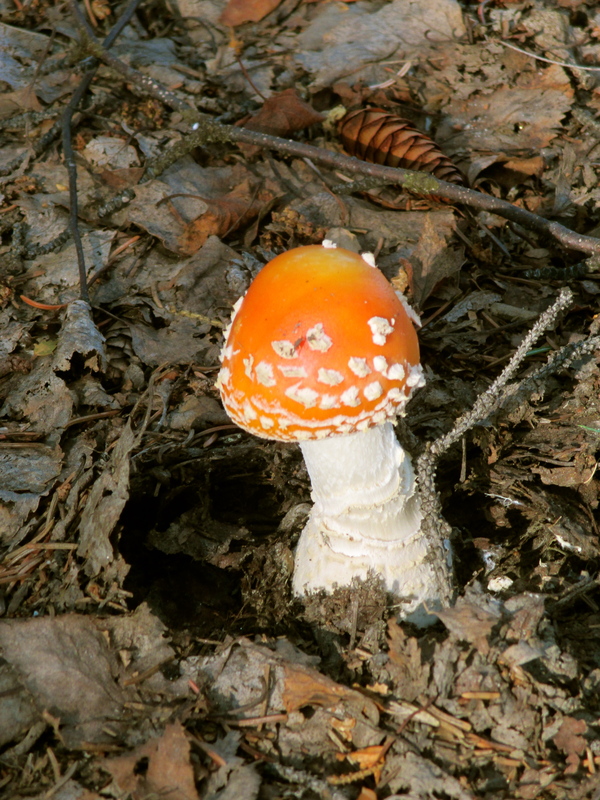 Bursting out of a rotting carpet of birch leaves and spruce cones partially covering the moose droppings was a speckled dome of flame, an Amanita muscaria, gorgeous, deadly, my favorite mushroom and, more importantly, the only one whose Latin name I actually knew thanks to having been around in the 60s. I took a quick photo, walked back home, and hopped in the Subaru. It was time to pick up little r and share the magic with him. So descriptive, Susan. Yes, I could even smell the rotting carpet of birch. Thanks, Peter. 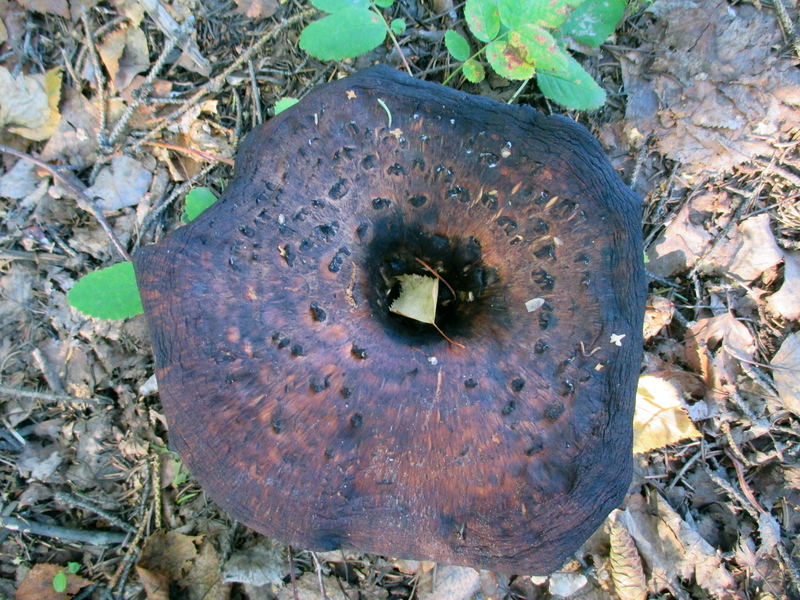 Wondering if there’s a poem hidden out there in the rot. I envision sitting on a stump with my journal and pen, waiting for the muse to show up before the mosquitoes eat her alive. 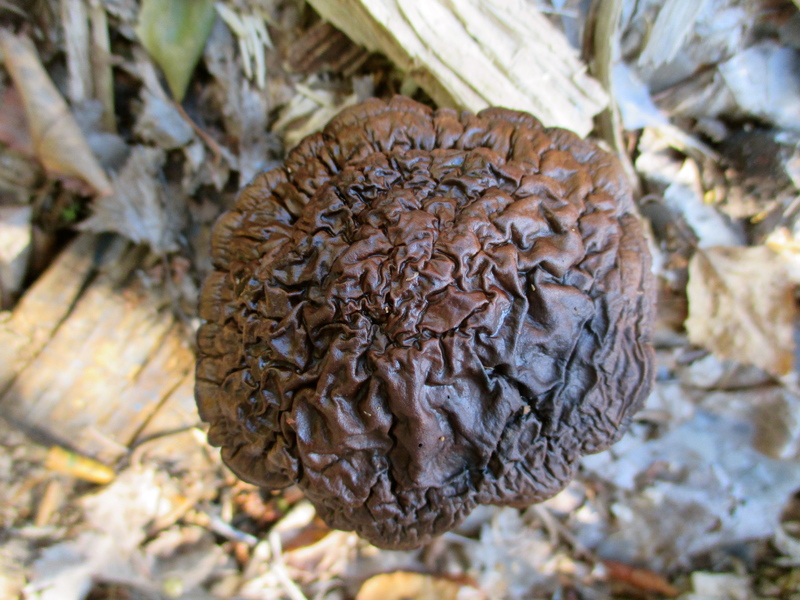 Lucky you to have guests who can recognize the edible mushrooms. 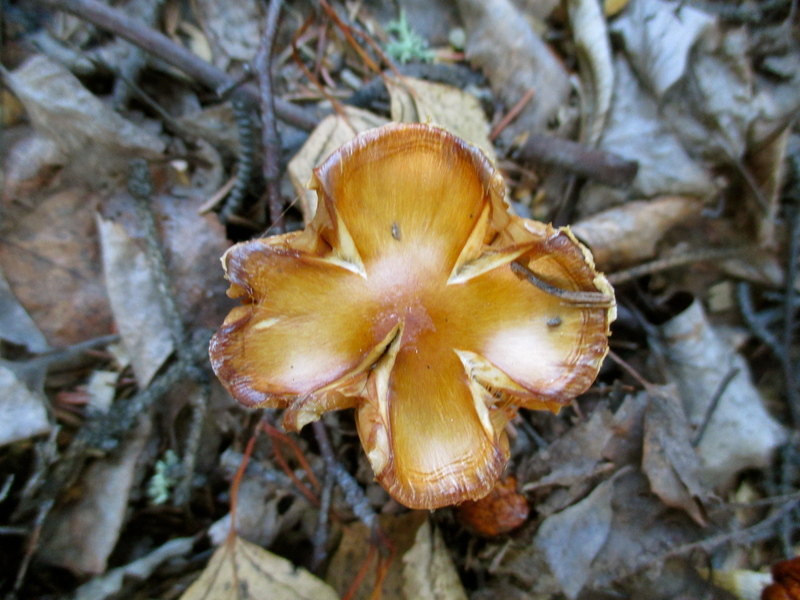 I remember years ago a friend from Australia as visiting my family in CT and she picked mushrooms that were in the field- and knew they were safe to eat. My mother was a nervous wreck worrying about their safety. We ate them and were fine. Lovely, Susan! Thanks for taking me on that walk with you. And for the perfect names–brain on chocolate. Hah! 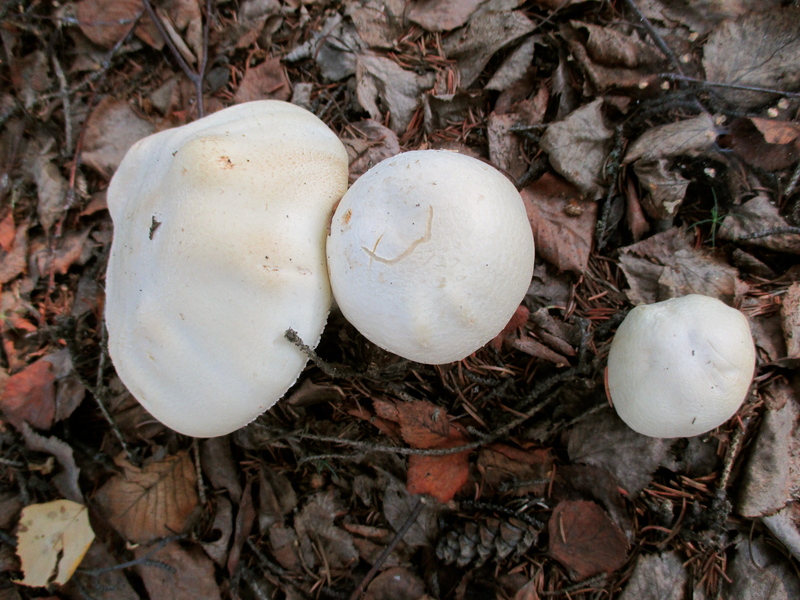 I know shaggy manes and puffballs, and the amanita, but the rest are new to my eyes. Ah, Rev is lucky to have such a Gooma! Thanks, Victoria! I think Rev is inspiring exploration in me. We’re both coming of age and I’m excited to carry this new energy back to the Ham. If you know a good place for shrooming, let’s hike there. I LOVE your names for them! For get learning the others, just tell everyone your names because they are the real names doncha know? You’re so right, Katie! Naming the world is much more fun than memorizing it. Madness! Am awed by the diversity–thank you for documenting–phenomenal–by the way, brain on chocolate—that was funny! Also, I’ll take one Puppy Face and two Brain on Chocolate to go, please. Jennifer, thanks so much. Next to Amanita, which rhymes with Goomanita, little r’s word for “Granny,” those are my two favorites. Shroom? Love the look and sound of it. What? Not a scrabble word! How awful!